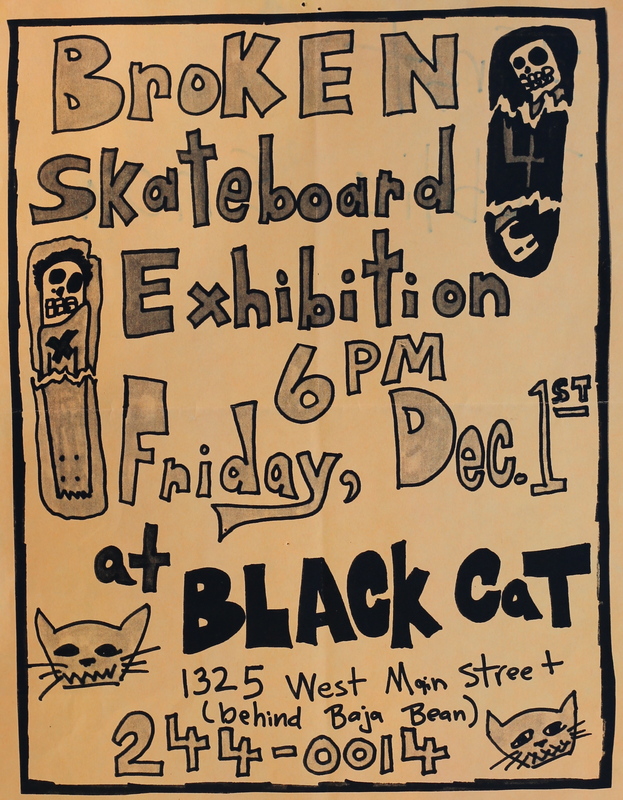 Back in 2007, when I was living in Charlottesville, Virginia, I stumbled across a skate shop called Black Cat. The storeowner was very down to earth and a really cool dude. On my first trip, I just looked around, but on my second trip I picked out a mint green Krooked board with a design by Mark Gonzales, AKA “The Gonz”- a professional skateboarder, artist and owner of the Krooked company. Initially, I had no idea who he was or even anything about the company he created, but thanks to the guy behind the desk, I was introduced to a creative genius. If you don’t know anything about Mark Gonzales, ask Google and watch some of his videos on Youtube – he is ridiculously awesome. We talked a lot about how important the artwork was to a board and the skate industry. That conversation evolved into a discussion of our own artwork and painting in general. He had this great idea for an art show in the store using old broken skate decks that customers brought in to transfer over their wheels and trucks to a new board. He handed me a few decks and invited me to make something. This would be the first time I was in a “real” art show. And it couldn’t have been any cooler. On the night of the opening he had a cooler full of PBR. Every show I had been to up to that point had served wine and cheese and so on. Today PBR is a modern art show staple, but it was a first for me then. I didn’t end up selling either of the two paintings I did (didn’t take any photos of them either), but the experience was priceless. I was really proud of myself for being involved more than anything. Thinking back, it was not my best work, but taking that first step of putting my work out there was a huge accomplishment. Recently, I wanted to pay homage to that experience. Using one of the 6″ round panels, I recreated my own version of the logo from the skate shop. One major change is the white vs. black cat. At the time, I was reading a biography on Elliot Smith and had his catalogue on repeat while painting. There seemed to be a lot of references to white things – his Prada suit and drugs come to mind. Plus, white is the opposite of black and I always like to turn things upside down. The most important aspect I wanted to maintain of the original logo was how pissed off the cat looked. I hope that is evident.